Nacho is a Arizona native, Chicano traditionalist that began his tattooing career in 2008. A lifelong artist, nacho would sell his drawings to his classmates in elementary school. At the age of 14 he did his first tattoo and realized his life long passion. When he is not tattooing you can catch him drawing and painting his own original tattoo designs, which are available to clients for tattoos. Nacho is an experienced tattooer with a passion for old school, traditional bright and bold designs, smooth black and grey, but is proficient in many different styles. 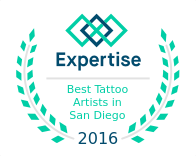 Nacho is an expert in taking client ideas and making them into quality tattoos that will last a lifetime! To schedule a consultation or tattoo appointment with Nacho, please call the shop or use the website contact form and our scheduling manager will get you set up with an appointment.